college | If you think legalizing marijuana won't affect you... Think Again. "There is some more welcome news for parents as they send their children off to college this fall. Perhaps the most important is that 5 out of every 10 college students have not used any illicit drug in the past year, and more than three-quarters have not used any in the prior month." 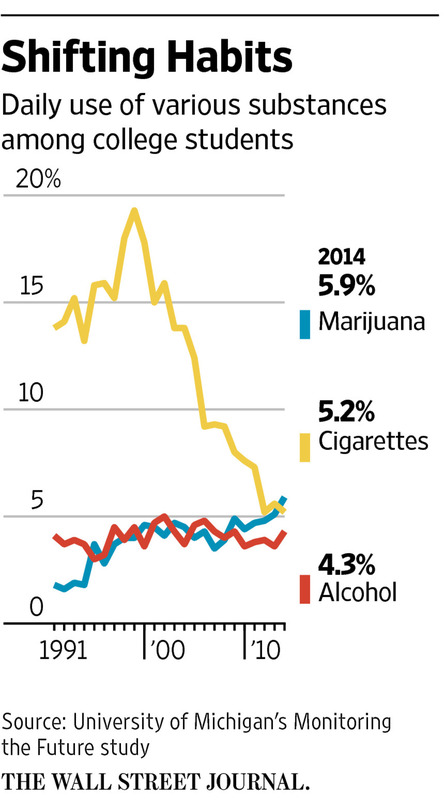 Alongside regular users, the number of occasional marijuana users has also increased. Between 2006 and 2014, the percentage of students who reported using marijuana once or more in the prior 30 days increased from 17% to 21%. During the same period, the percentage reporting use in the past year increased from 30% to 34%.